oh anabela, this is beautiful. i love coriander girl's bouquets. i am awaiting spring with bated breath! Wow, how light and beautiful. 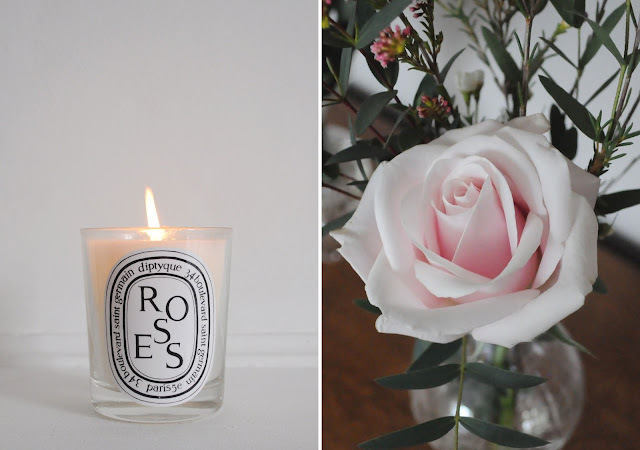 The Diptyque Roses scent is really incredible! My boyfriend (also a Jeff) wears it from time to time and I find it so intoxicating. 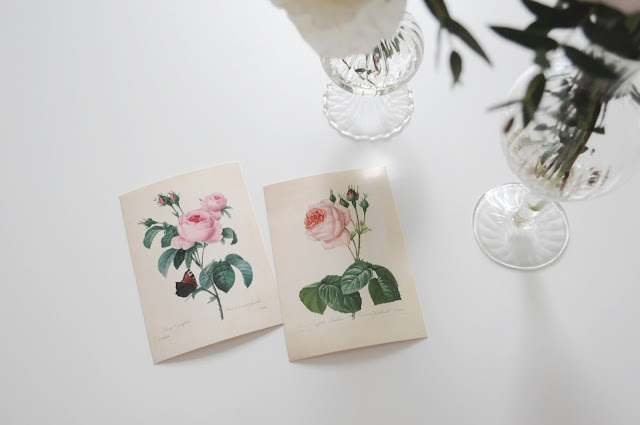 We love the flavor of rose, so I can't wait to try these. Did they pair well with the chocolate cake? I thought it did, although to be honest I'll have to give it another try—my senses were really off last week because I was ill! Ahhhhhh you are so good! I'm dying to try. There are pasteurized liquid egg whites and powdered egg whites for reconstituting made for this exact procedure. Your cake turned out lovely! Oh thanks so much for letting me know! Luckily we didn't get sick this time! Cool, thanks! Maybe I'll try that next time. A family favourite! Versatile, fast, delicious, and adaptable. Sometimes I just melt some chocolate chips on top of the freshly baked cake, and spread that around as the icing. Another fun version is to add red wine instead of 1/2 the water, and make a red velvet cake. Yum!! Thanks for passing that along. How pretty. 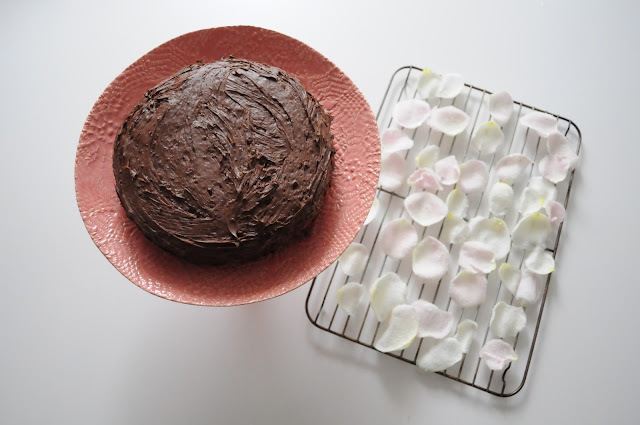 And what a treat that cake with your candied rose petals must have been. gorgeous, i must try this once my garden starts blooming! i thought Pony couldn't get cuter but sugar dusted whiskers?!? omg. Omg so jealous. Although I do have my lone peony... maybe I can candy it! oh my gawd. the most divine of posts! must try immediately. i recently found this post on roost: http://www.roostblog.com/roost/rose-water-video.html and have had rose petals on the brain non-stop just wishing for spring. We just can't take it anymore! And man, that looks so good. 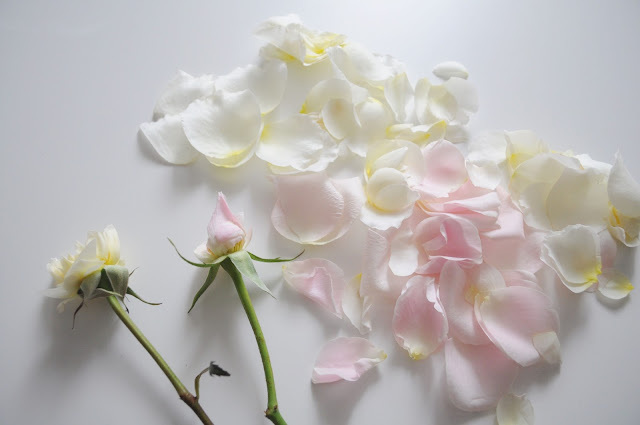 Gorgeous, the petals are so perfect! Simply beautiful! Love the petal decoration! Oh, this is lovely! 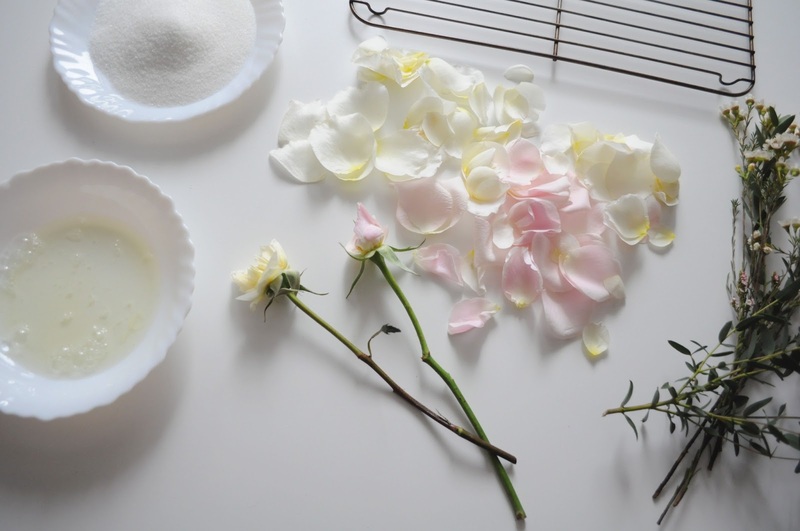 I was planning to make this cake http://www.ruemag.com/lifestyle-entertaining/in-the-kitchen-with-jennifer-martine for my upcoming birthday, and candied rose petals would be the perfect decoration. Also, Pony! So cute with that little paw. Oh dang, that cake looks so good! 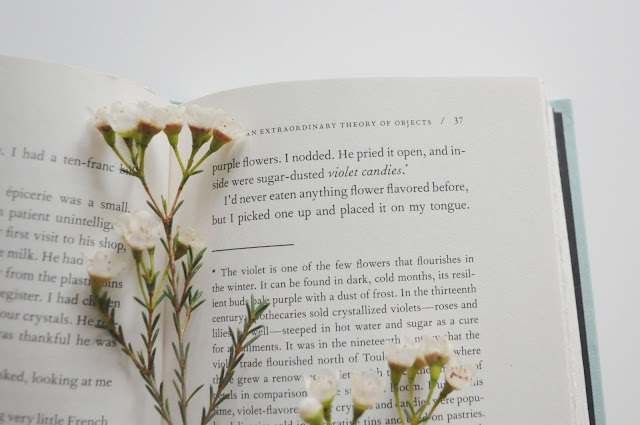 This is so pretty and lovely! Haha nothing I touch is really that fancy! 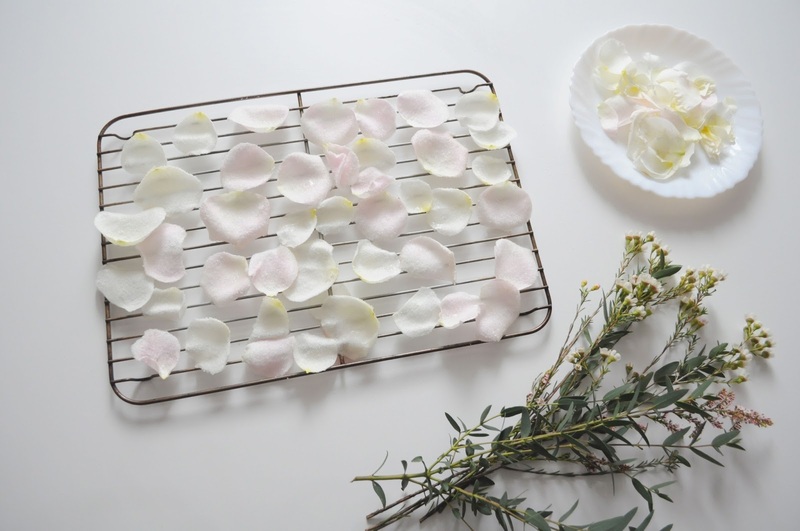 Ooh, I've never tried sugaring petals but these look so pretty! ooo wax flower is my favourite, Geoff knows his stuff. This is so cool. Lovely!! ps. 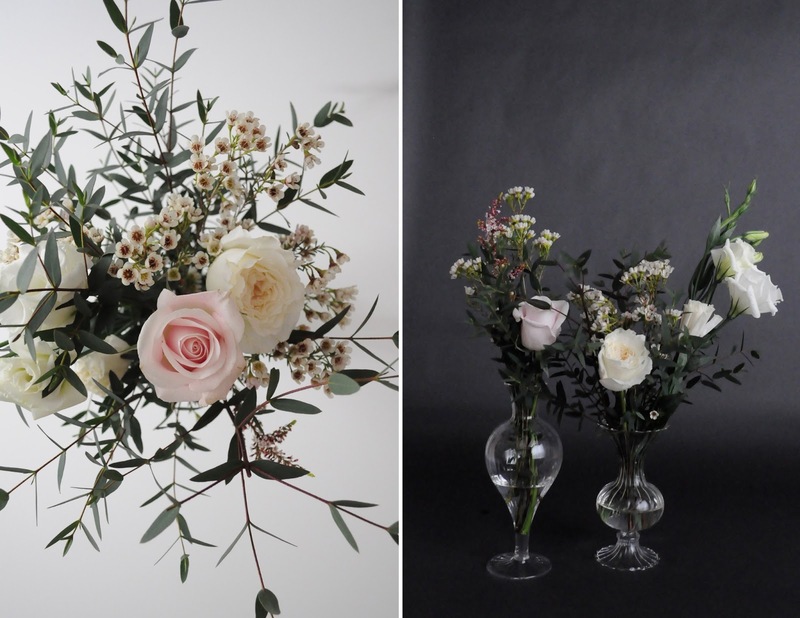 those BHLDN vases are stunning. they make nothing but solid gold. They look incredible! I love that you actually did it, I've been dreaming of candied flowers ever since we had that conversation. Delicious! 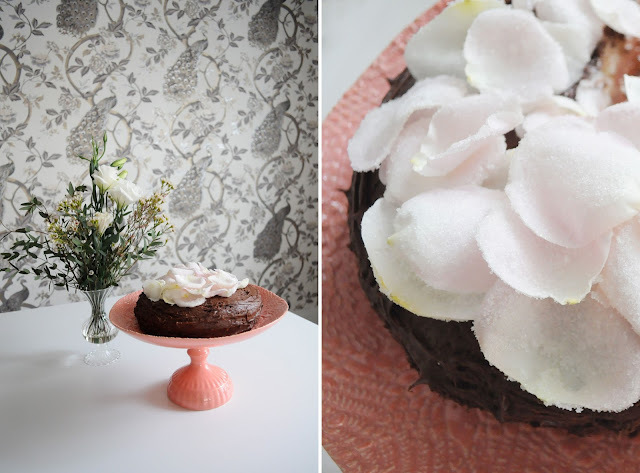 beautiful - never had candied flowers on cake before, would love to try! *gasp* well suddenly I want to do nothing but candy roses! Also Pony with sugar-whiskers is just the cutest thing, and so continues my vicarious cat-living. I love the blushy pinks and yellows against the chocolate and the coral cakestand, it's a glorious combination.